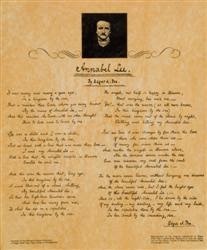 According to types of poetry, the poem by Edgar Alan Poe titled Annabel Lee is included in Elegy. The reason why it is elegy is because it talks about the death of Annabel Lee as the subject of this poem. It also tells us about the despondency between the speaker and his woman. The one thing that makes it interesting is that how the writer expressed his losing feeling with emotional diction driving us to feel what he felt. The writer retold his commitment and loyalty towards his beloved maiden. It is also knotted that they had a really strong love that death cannot even make them apart. The speaker described her woman as a beautiful maiden, whose name was Annabel Lee, lived in a peace place, that all she did was only to love him. It proves that the woman was in love and would sacrifice everything for him. The young lovers loved each other which felt so wonderful. Love has always been a wonderful feeling. The young man and woman were still in a pleasure of love, but death separated them. The sentence ‘A wind blew out of a cloud, chilling’ beckons the situation of the mourn day when the woman died. Another sentence is ‘So that her highborn kinsman came and bore her away from me, to shut her up in a sepulchre.’ It can be understood that the woman died and left the man broken. The man could not believe, and fell in a sorrow of his passed away love. In the fourth and fifth stanza, the man cheered himself up. He imagined as if Annabel Lee was still by his side, with the same love, making everyone jealous of their really powerful love. Though death ruled, their love held on. Though one of them was gone away, another one was to stick around as if they were still together. The man emphasized that their love was bigger and larger than anyone else had. He also accused that the reason why Annabel Lee died was because the angels above were jealous with them; so that those angels took the woman to heaven to make them apart. Finally, the man accepted the reality that Annabel Lee had died. In the sentence ‘And so, all the night-tide, I lie down by the side of my darling- my darling- my life and my bride’ beckons that the man would die to be by his woman’s side. Or, maybe the sentence tells that the man often came to Annabel Lee’s grave. From the interpretation above, we can take a conclusion then that this poem conceived the elements of elegy. It mostly talks about death and the feelings caused by it. There are also some expressions of how big the love Annabel Lee and the writer had although death made them apart for ever. Pick what analysis aspect of Annabel Lee you want to read by clicking below links.